A few ideas of creating a whole new bathroom without spending a fortune for it. If you have plain white bathroom paint, I would suggest of putting up some spice color or bright color to it. Painting the covered of the color you desire, it would perfectly make the whole bathroom wall look different. 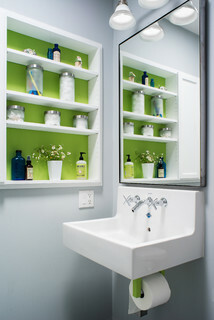 Or change the color of plain one to one of your bathroom accessories to brighten it up. Simple yet adorable not only for your look but for your guests who will going to use the bathroom when they visit.